July | 2015 | Cooking is Fun … Really!! Things seem to be very slow these days on both LJ and blog country. It’s quite depressing when no one seems to be reading your posts. So, I’m taking a break too. That will be hard since my camera is usually in the kitchen waiting to snap a picture of the latest dish. I took it with me today when I went out for sushi. It will be my last chance to eat out until the fall when I go back to work. I may post pics or maybe not. I still haven’t posted the pics from my dim sum outing a month ago. I’m low on flour so I’m going to have to get a new bag before I bake any bread. Speaking of baking bread, I harvested some wild yeast and am trying to make my own sourdough starter. And I have a huge backlog of food in the freezer to eat … and fanfic to read. And I should really go through the attic and clear out my parents’ clothes, old books and miscellaneous junk. I bought a big bunch of fresh mint at the city market a week ago and had to come up with some quick ideas for ways to use it up. 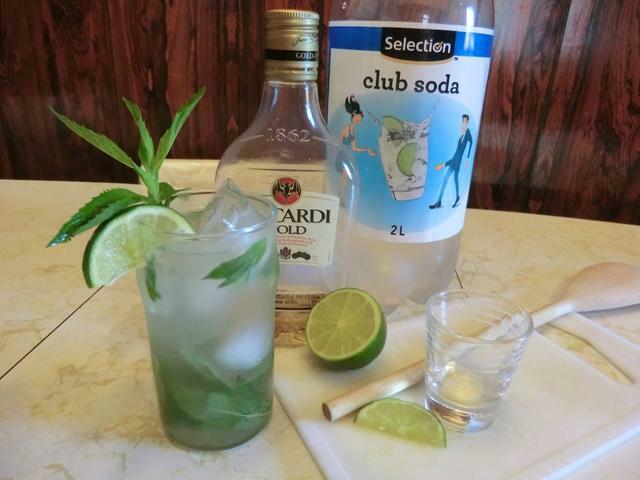 Of course, there’s the classic Mojito. 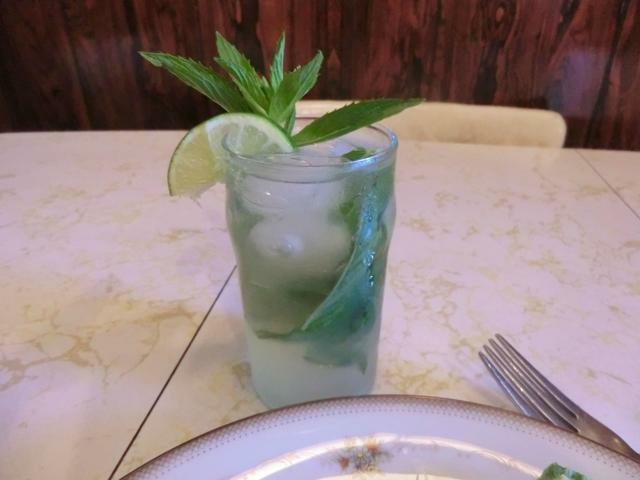 In a tall glass, add sugar, lime juice and mint leaves. Use a muddler or the handle of a wooden spoon to crush the mint leaves. Fill the glass with ice cubes and fill up the glass with club soda or soda pop if you want a sweeter drink. Garnish and enjoy. A simple mint tea with honey is tasty as well. 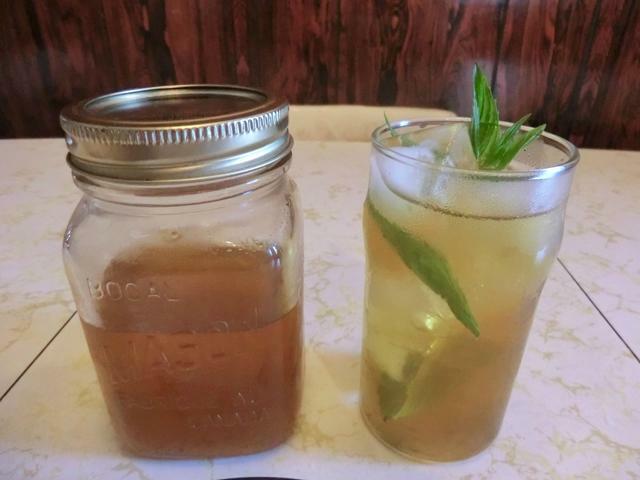 I gave my iced mint tea an extra kick by steeping fresh mint leaves along with a Moroccan loose leaf mint tea blend. 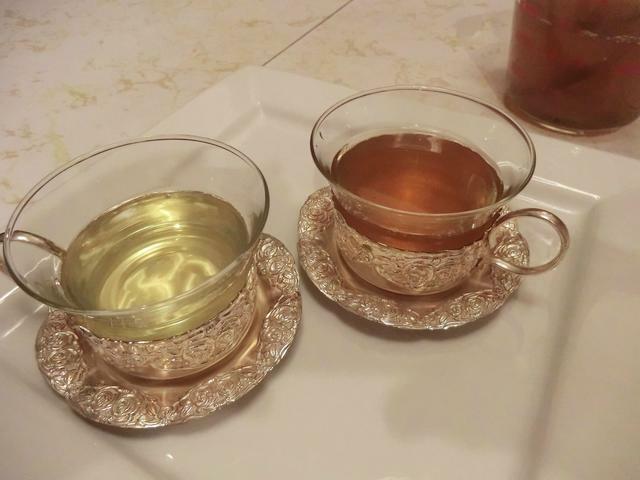 The lighter cup in the picture on the right is tea made from steeped fresh mint leaves while the darker cup has the dried tea blend. 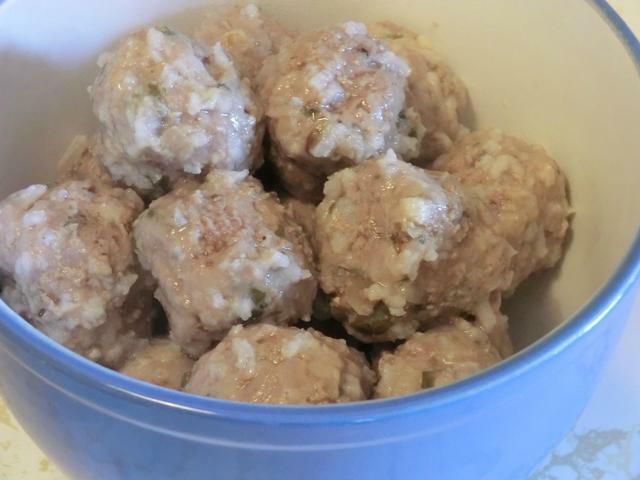 Youvarlakia or beef and rice meatballs to be added to Avgolemono soup. You can find the soup recipe here. 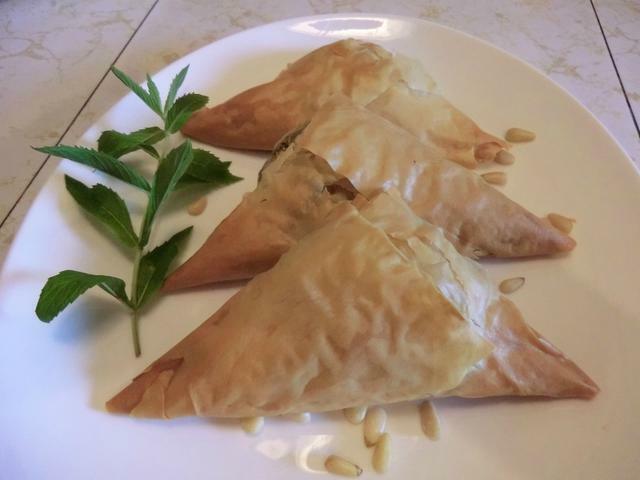 And, finally, Spinach, cheese and pine nut phyllo triangles. I used this basic recipe but simply shaped the phyllo differently. 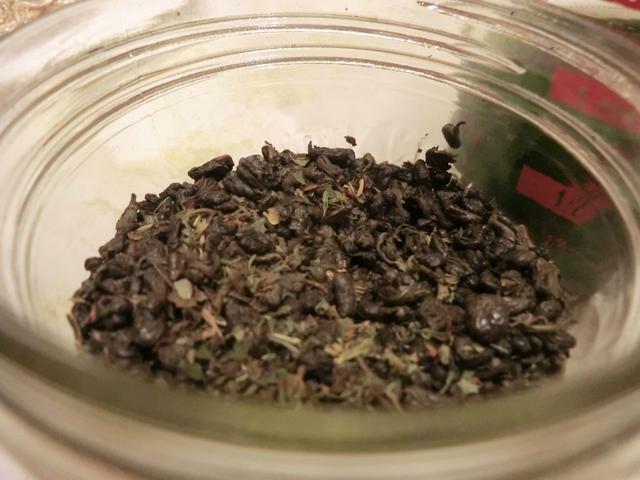 I had no fresh parsley so I used dried as well as some dried dill weed but I used LOTS of fresh mint and green onions. 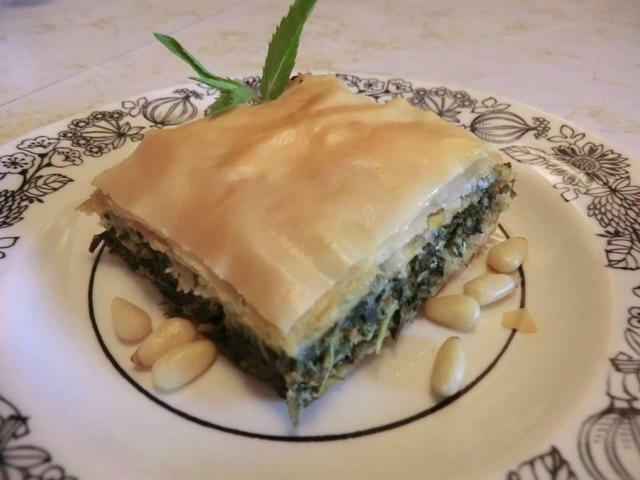 I love ‘phyllo’ … whether sweet or savoury, you can find so many ways to use it. 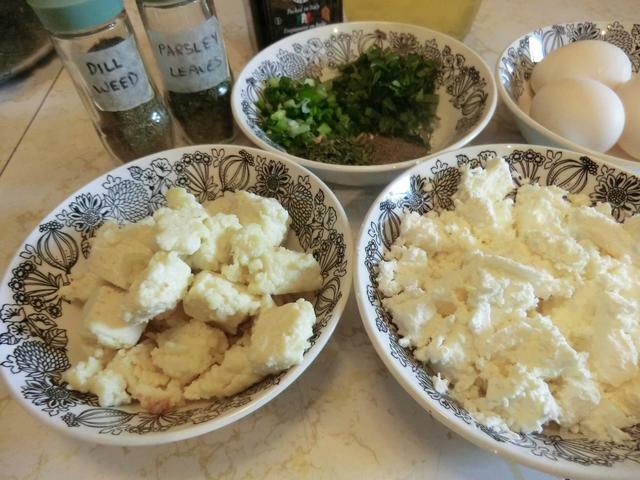 I added ~1/2 cup of home made paneer cheese crumbles to a generous cup of feta cheese, 1/4 cup of roughly chopped pine nuts, the herbs (fresh or dried), 3 eggs, salt and pepper for a tasty filling. 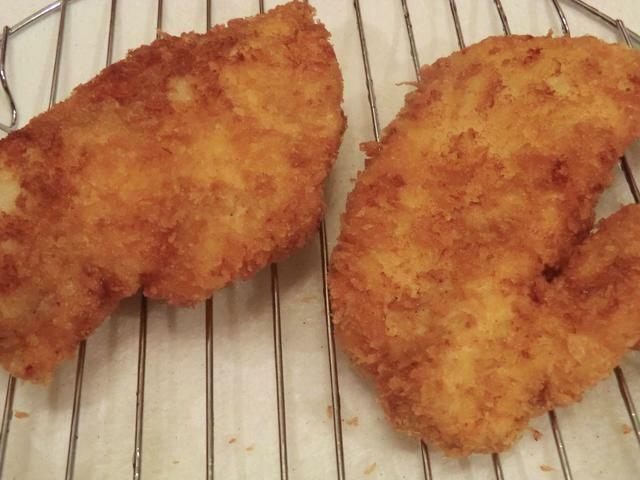 Earlier in the week, I had butterflied a couple of boneless, skinless chicken breasts and turned them into chicken fingers along with the tenders from 6 breasts. Coated in a simple home made version of ‘Shake’n’Bake’ using regular dried breadcrumbs and baked in the oven, they were delicious. But … I had a craving. 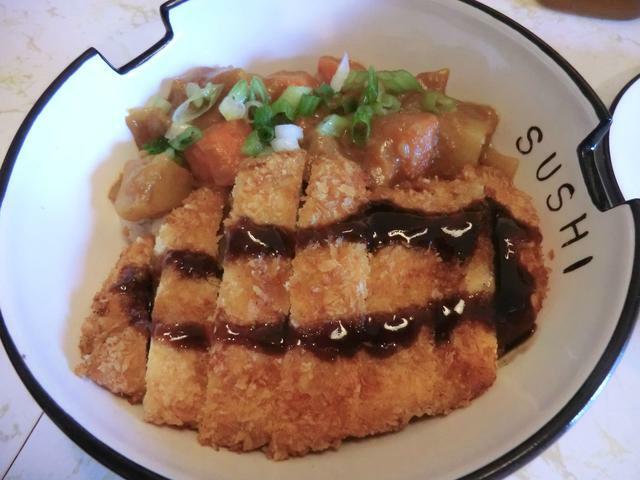 A craving for chicken katsu. A thin cutlet of chicken breast, floured, egg washed and dipped in Panko. And FRIED!! So that’s what I did late Friday evening with the 2 chicken cutlets that I had set aside. One was a bit too thick and uneven but I didn’t bother pounding it down so it would be even. Cause it was late enough that I just didn’t care. The next day, I served it in one of my sushi bowls over hot sushi rice. Even though the crust had lost a lot of its crunch, it was still good. And worth frying. No Japanese beer but the Moroccan mint iced tea was lovely. Dip each cutlet first in the flour, shaking off the excess, and coating each side. Then dip each side of the cutlet in the beaten egg, letting the excess drip off. Finally, coat the egged cutlets in the Panko bread crumbs, pressing the Panko into the cutlet so it will stick. In a large cast iron skillet add enough vegetable oil to a depth of 1/2-3/4 inch. Heat the oil to 350 deg. Fahrenheit (medium-high on an electric stove if you don’t have a deep frying thermometer). 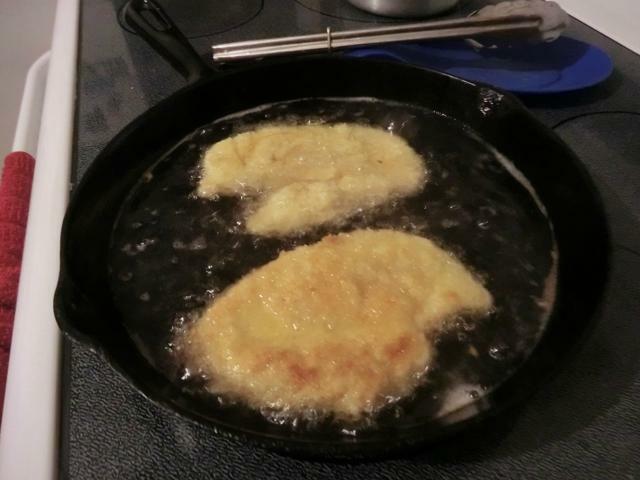 Add a couple of cutlets at a time and fry until they’re a golden brown colour (5-7 minutes), turn and repeat. Drain on a cooling rack set over a plate with several layers of paper toweling to absorb the oil. 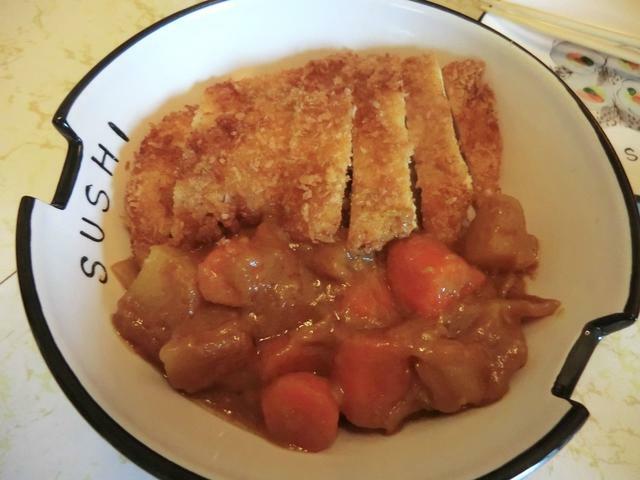 Do not place the cutlets directly on the paper towels as the crust will get soggy and you want a nice crunchy crust. ** If you want a meat curry, cut chunks of chicken, pork or beef into bite sized pieces and brown in the oil before adding the onions. About half a pound of meat is plenty. For a tougher cut of meat, like the beef, you may want to simmer the meat for 10-20 minutes before adding the vegetables so they don’t get too mushy. In a large saute pan, stir fry the onions over medium heat for 7-10 minutes until tender and getting browned. Add the garlic, salt, carrot and potato chunks and stir fry for another few minutes. Add 2 cups of water (you may need more to just cover the vegetables) and bring the water to a boil. Cover with the lid and reduce the heat to a simmer. Cook until the vegetables are fork tender, about 20 minutes. Turn off the heat and take the saute pan off the burner. Break up the cubes of curry paste and stir into the vegetable mixture. 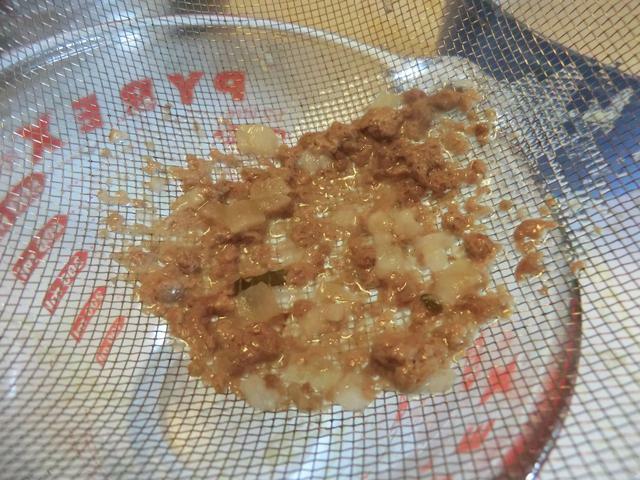 The residual heat will help dissolve the cubes and thicken the mixture. When the cubes are completely dissolved, put the lid on and let the curry sit for about 10 minutes before serving. Serve hot with rice, pasta or bread. 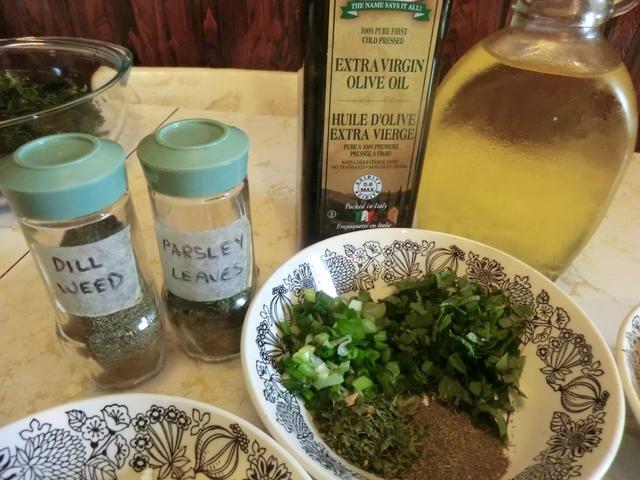 I’m reposting this recipe by itself cause too many people seem to have missed it in its original Canada Day posting and it deserves a second look. I’m adding a couple of new pictures as well. 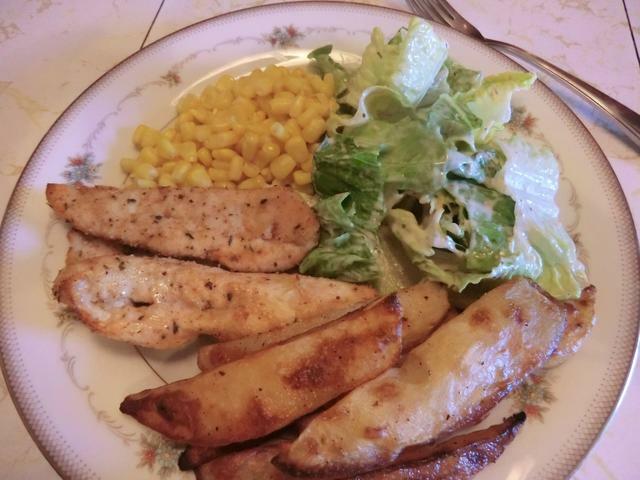 It was too blah and gray to bbq so I made chicken cutlets out of some of the boneless and skinless chicken breasts I bought on sale yesterday and served them with roasted potato wedges and a classic mojito. I finished the meal with no churn ice cream. 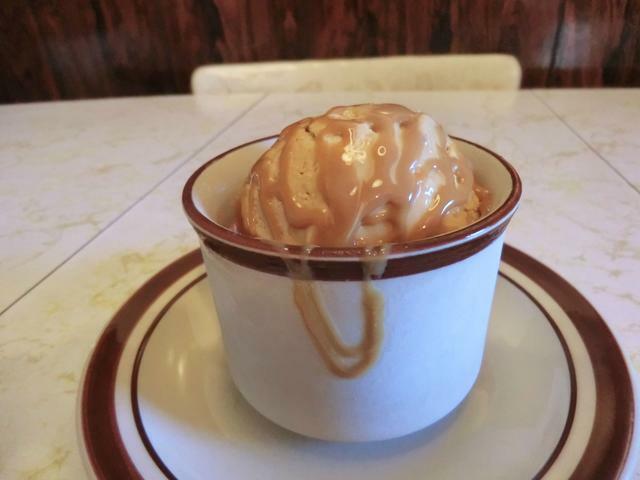 I’ve made ice cream before using the classic cooked egg custard and my inexpensive ice cream maker. It was very tasty, but time consuming to make, since you need to pre-chill your freezer container for a MINIMUM of 24 hrs…72 is much better. And you have to make your custard mixture the day before and refrigerate it at least overnight before churning it. As with no-knead bread, I thought the concept seemed too good to be true. All you need is sweetened condensed milk, whipping/heavy cream and flavourings. And time, of course. You have to let your mixture freeze for at least 6 hours or all you get is a milkshake. I had a can of dulce de leche flavoured sweetened condensed milk, that I bought on sale a while ago, in the pantry … which would save having to buy the plain version. So I gave it a try. After all, ice cream and summer go together. In a large bowl using an electric mixer, starting at low and gradually increasing speed to medium-high, whip the cream until stiff peaks form. 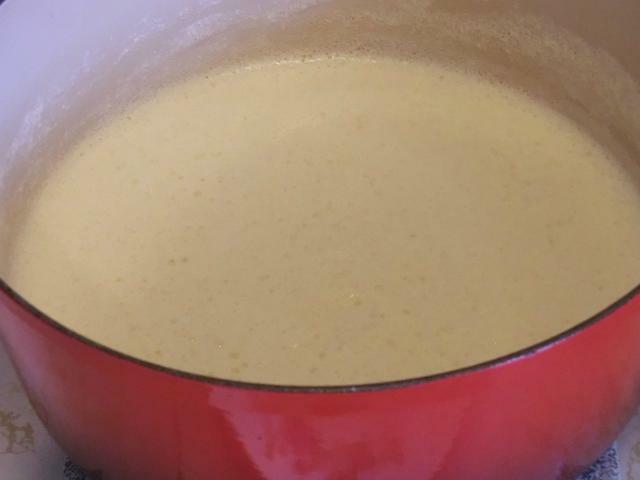 In medium bowl, combine the sweetened condensed milk, bourbon and vanilla extract. Gently but thoroughly fold whipped cream into the milk mixture, being careful not to deflate the cream. 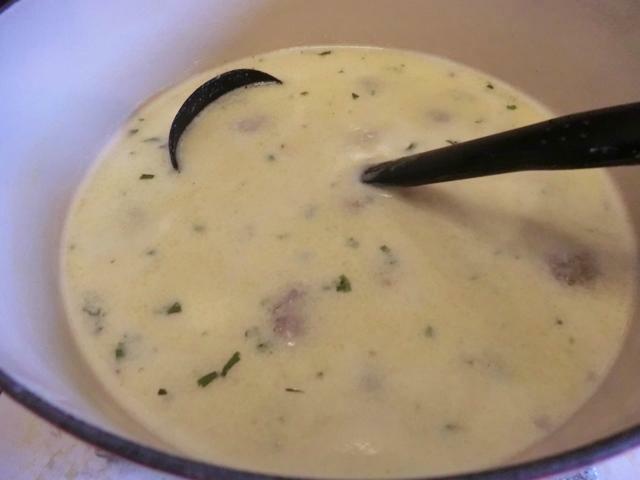 You can start by stirring in about a cup to lighten the condensed milk mixture and then fold in the rest. Spoon the mixture into a metal loaf pan or any freezer-safe container, lay a sheet of plastic wrap directly on top of the ice cream and freeze for 6 hours or overnight. 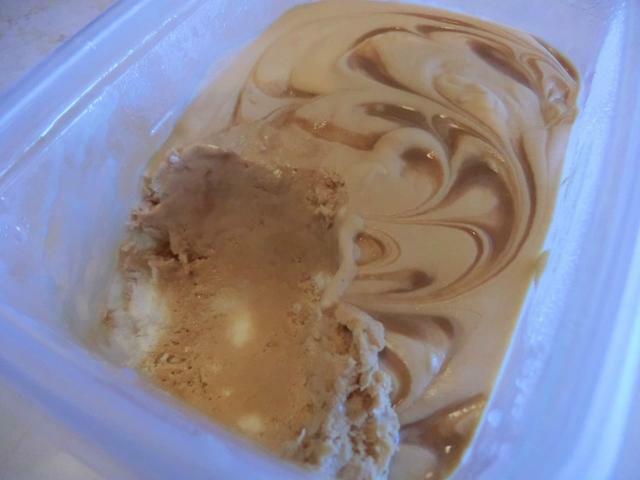 You can drizzle additional dulce de leche over the ice cream as you pour it into the container. 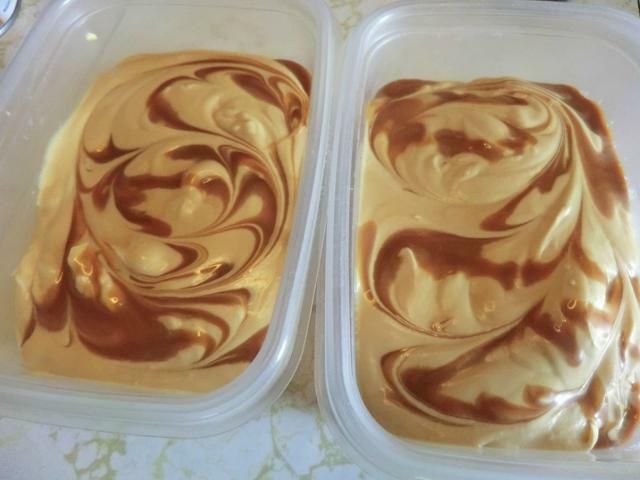 In Canada, a can of dulce de leche contains 300 ml, so you’ll have about 50 ml to play with. 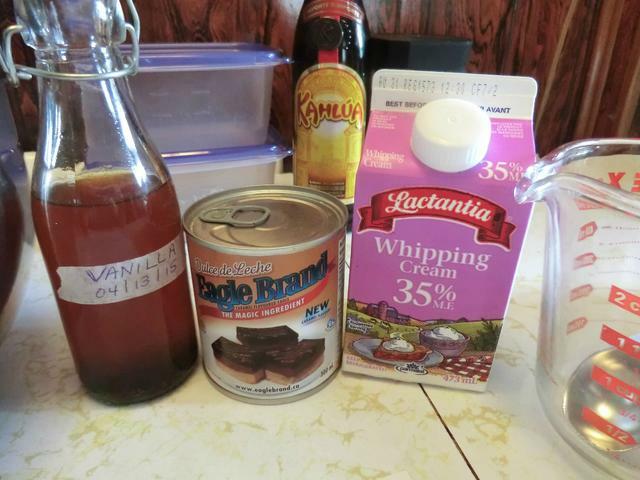 NOTE: I used 2 tbsp of my whiskey vanilla bean extract in place of the liquor/vanilla combo. I tried to fold the whipped cream into the condensed milk mixture as carefully as possible in order not to deflate it but I lost a LOT of volume. Hopefully you’ll do better. 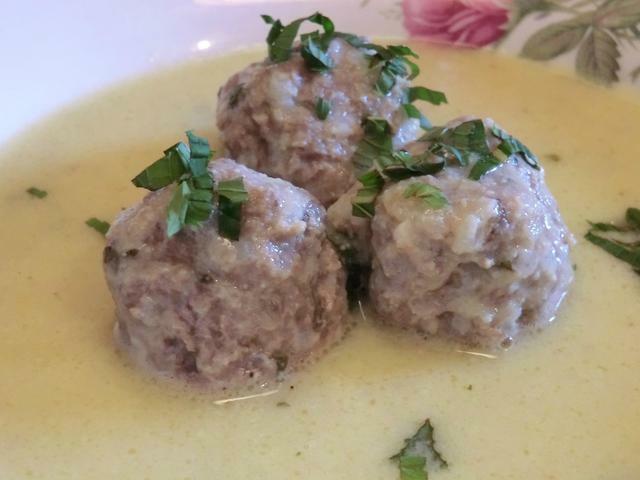 Greek Beef and Rice Meatballs in Egg-Lemon Sauce Soup … OPA!!!! 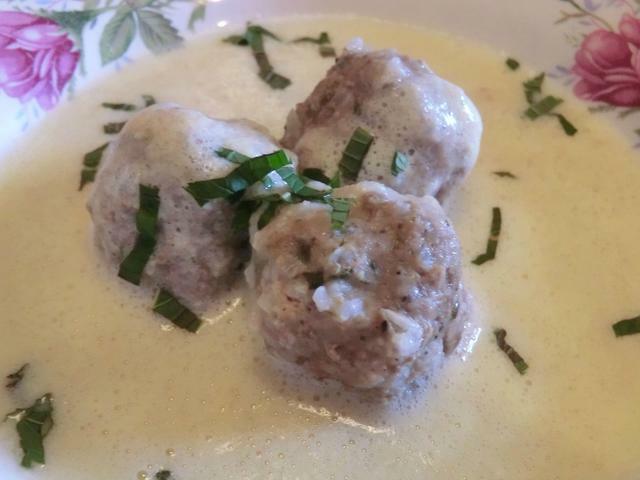 There are two very similar beef and rice meatball soups that I like and that I was torn between making … a Greek version in an egg-lemon sauce which is called “youvarlakia avgolemono” and a Spanish/Mexican version with a tomato based sauce called “albondigas”. I chose the Greek version because I wasn’t in the mood for tomatoes and because I hadn’t made an avgolemono soup in some time. The previous version used shredded chicken and rice in a flavourful and slightly tart broth … chicken soup with a definite Greek twist or two. NOTE: You can cook your meatballs right in the chicken broth but I wanted a cleaner preparation so I precooked the rice meatballs in salted water. The rest of the soup was made with chicken broth. If you don’t want to lose the flavour from the cooking liquid or don’t have chicken broth, remove the meatballs, strain the cooking liquid and add 2 heaping tbsp of chicken soup mix to it for a more ‘chicken-y’ taste. 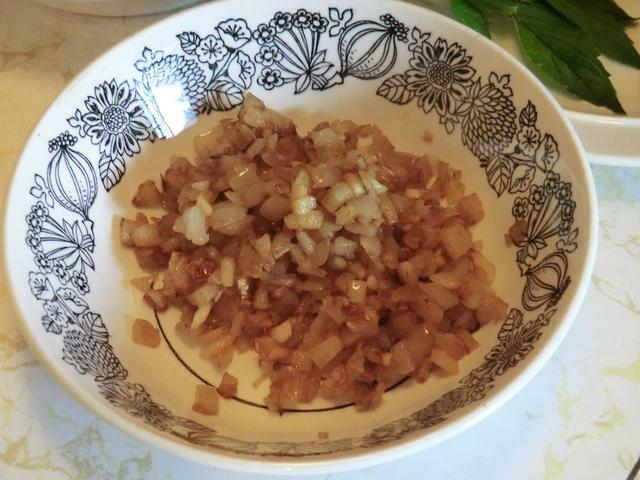 I don’t like the texture of boiled onions in my meatballs so I sauteed them and the finely minced garlic in 1/2 tbsp of vegetable oil, drained and let them cool before adding them to the meat mixture. 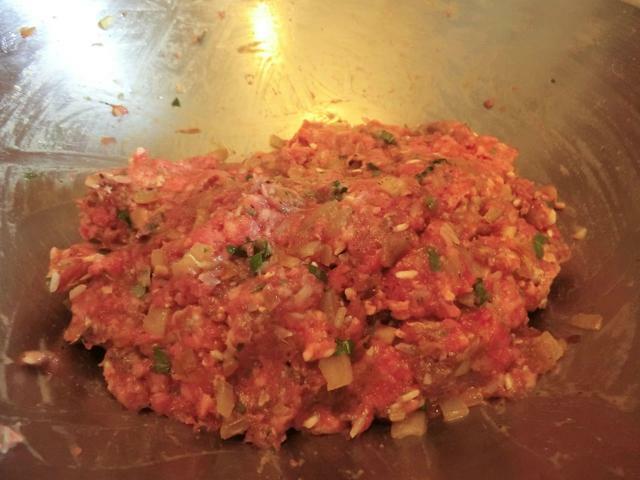 In a large bowl, combine the beef, rice, onion, garlic, parsley, mint, oregano, salt, pepper and beaten egg. Mix all the ingredients well. (Use your hands!) 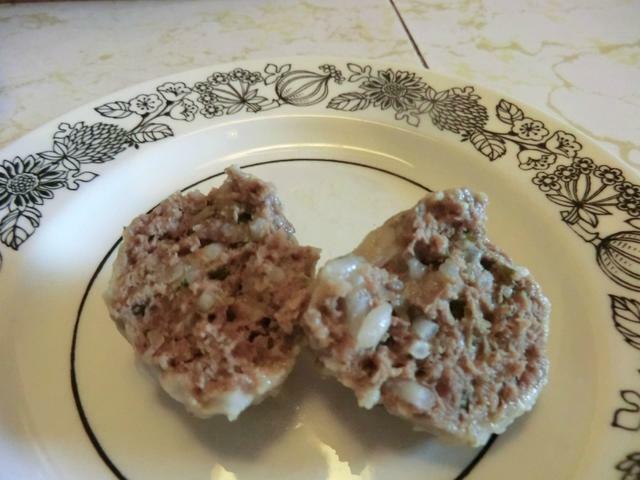 You may refrigerate the meat mixture until the next day at this point. 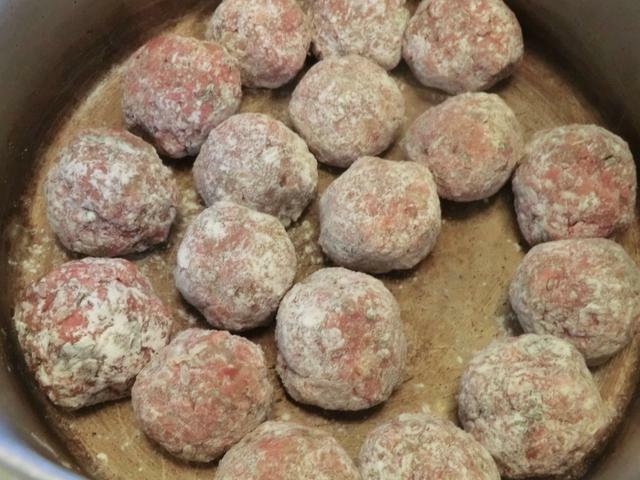 Put 1/2 cup of flour in a small bowl for coating your meatballs. Fill the stock pot with enough broth so that it goes about half an inch above the meatballs, and bring the broth to a boil. Cover and simmer for 45 min or until the meatballs are cooked through and the rice is tender. 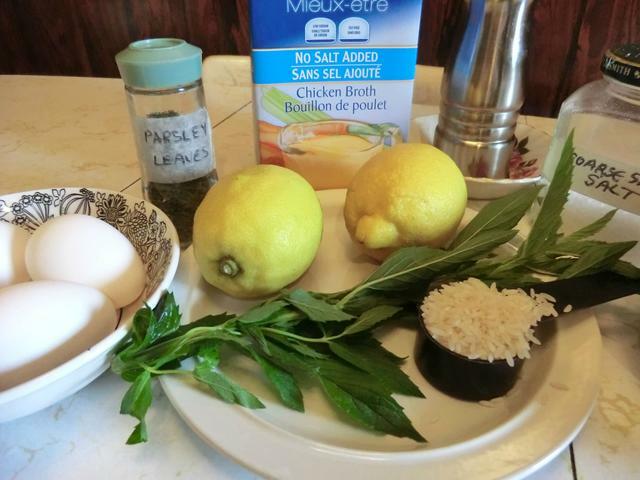 About 10 minutes before your meatballs are done, begin making your egg-lemon sauce. Separate the three eggs into two bowls. Place the yolks in a small bowl and beat gently with a fork. 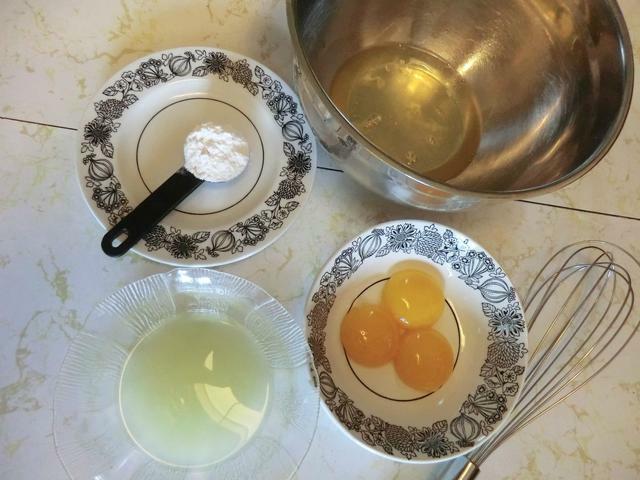 In a medium sized bowl, whisk the egg whites by hand until they’re frothy (a few minutes). While still beating, add the beaten yolks to the bowl slowly. Continue beating and add 1 heaping tablespoon of flour. Stop beating and add the lemon juice. Start by only adding 3 tbsp of the lemon juice. You can always add more at the end. 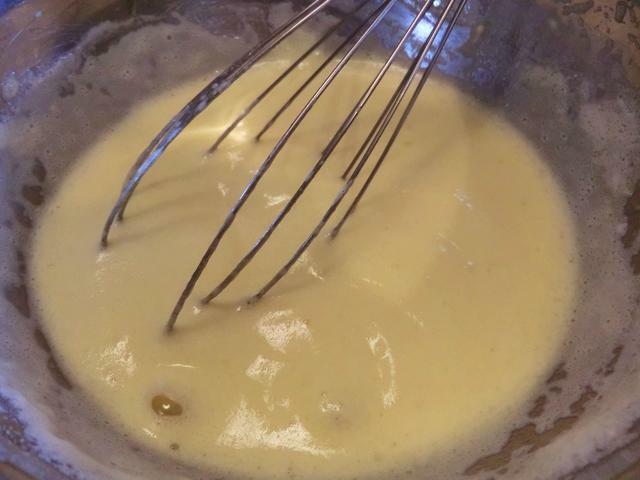 Whisk together until the mixture is smooth. 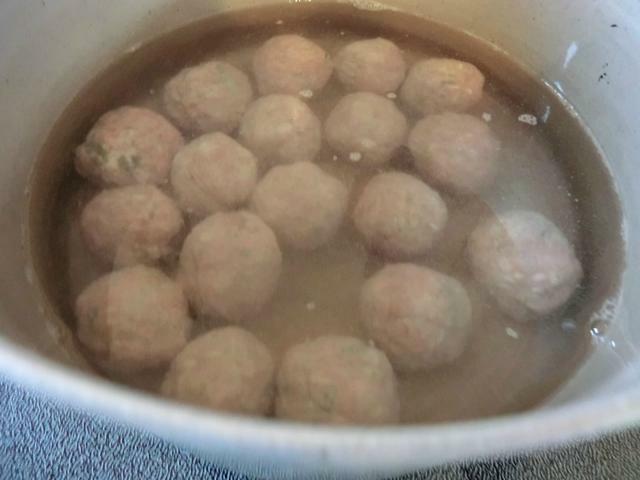 Once the meatballs are cooked, remove them with a slotted spoon and set them aside in a medium sized bowl. You may want to cut one in half to make sure it’s cooked through. Skim any scum from the top of the broth so it looks nice and clean. Or you may prefer to strain the broth through a sieve into another stock pot or a dutch oven. This came from straining 2 cups of the cooking liquid which I used for the egg-lemon sauce. Take 2 cups of the hot broth, a ladle at a time, and slowly pour it into the egg froth, mixing well as you do so. NOTE: This is important or the eggs may curdle when you add them into the hot broth. The mixture should be smooth and creamy. Pour the egg/flour/broth mixture back into the stock pot and bring the broth to a slow boil. Taste to see if the seasonings need to be adjusted by adding more salt and pepper or more lemon juice. Place 3 meatballs in each serving bowl and pour about one cup of the hot egg-lemon sauce over them. Serve immediately with a sprinkling of fresh herbs or sliced green onion on top. 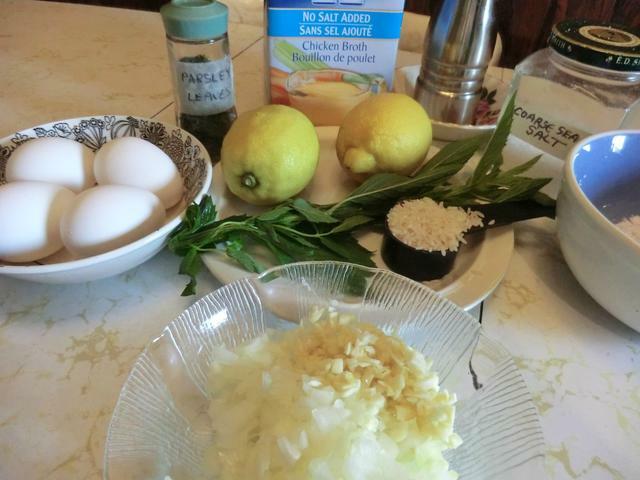 NOTE: You may also add the cooked meatballs to the egg-lemon sauce and serve family style out of the stock pot. The frothy sauce will lose its texture on standing and reheating so you’ll want to serve it immediately. Happy Canada Day / 4th of July! And then there were floats: Garfield who actually floated, Oscar in his garbage can, the Genie and his lamp from Alladin. Bands entertaining, representatives of the local Freemason chapter, classic cars and a costumed Batman, Leia with Storm Trooper and assorted robots to entertain the kids. A lot of fun for the families gathered along the parade route. 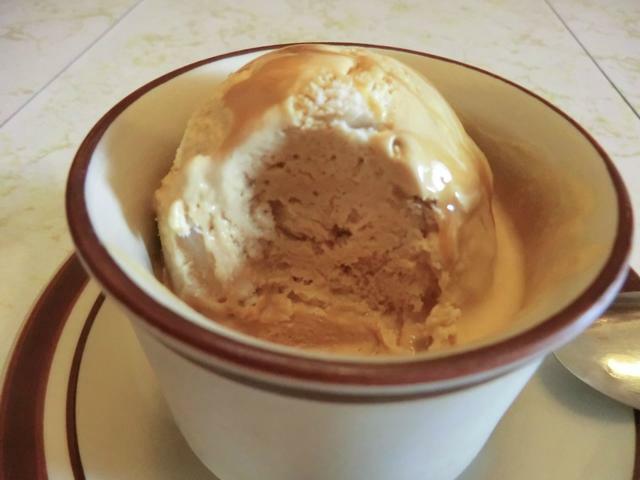 Dulce de Leche no-churn ice cream … look for the recipe on a subsequent post.